The global telepresence market is expected to reach USD 2.63 Billion by 2022 at a CAGR of 19.6% during the forecast period. 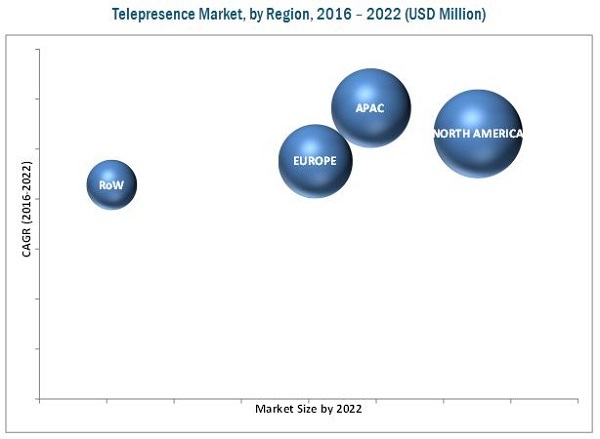 In this report, 2015 has been considered as the base year, and the period from 2016 to 2022 has been considered as the forecast period for the study of the telepresence market. The objective of the study of this report is to define, describe, and forecast the global telepresence market on the basis of system type, component & service, industry, and geography. The report also forecasts the market size of various segments with regard to industries and regions. The market based on geography is segmented into North America, Europe, Asia-Pacific, and RoW. 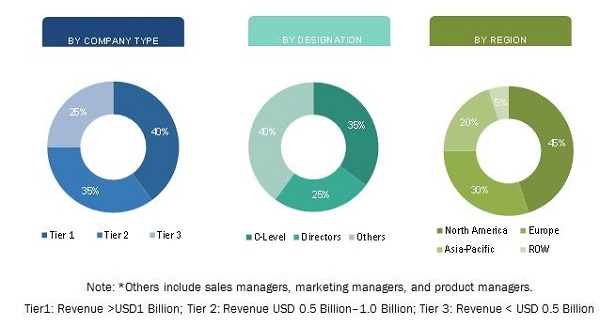 Additionally, the report provides detailed information regarding major factors influencing the growth of the market (drivers, restraints, opportunities, and industry-specific challenges). The opportunities have been analyzed for stakeholders by identifying the high-growth segments of the global telepresence market. The report also profiles key players and comprehensively analyzes their market ranking and core competencies along with detailing the competitive landscape. This research study involves an extensive usage of secondary sources, directories, and databases (Factiva and OneSource) to identify and collect information useful for technical, market-oriented, and commercial aspects of telepresence technology. Top-down and bottom-up approaches have been implemented to arrive at the size of the telepresence market. The figure below shows the breakdown of primaries on the basis of companies, designations, and regions, conducted during the research study. The telepresence ecosystem comprises key manufacturers such as Cisco Systems, Inc. (U.S.), Polycom Inc. (U.S.), Avaya Inc. (U.S.), ZTE Corp. (U.S.), among others; software manufacturers includes Polycom, Inc. (U.S.), Vidyo Inc. (U.S.) and LifeSize, Inc. (U.S.) among others; and service provider companies include Cisco Systems, Inc. (U.S.), Polycom Inc. (U.S.), and Teliris Inc. (U.K.) among others; these are connected with their partners and distributers for selling the complete systems to end users in various verticals. This report categorizes the global market for telepresence on the basis of component, system type, industry, and geography. The global telepresence market is expected to grow at a CAGR of 19.6% and reach USD 2.63 Billion by 2022. Telepresence helps in lowering the travel costs in small and large enterprises. Also, the growing demand of immediate assistance to the remote patient in the healthcare industry is driving the growth of the overall telepresence market. Telepresence market is segmented on the basis of component & service into hardware, software, and service. Hardware components held the largest market share in 2015. These include displays, projectors, cameras, sensors, audio devices, lightings, and others. Telepresence has applications in industries such as healthcare, commercial, consumer, education, manufacturing and others as they help reduce costs and the wastage of productive time in the long run. The enterprise sector held the largest market share in 2015 due to the increasing implementation of these systems across small and large businesses. The APAC region holds the largest share; it is expected to witness the highest growth rate between 2016 and 2022. The increase in start-ups in this region would also help in market growth. High initial investments and installation costs are a major restraint for the growth of the telepresence market. High costs are required to design and develop remote telepresence systems for a user to be able to experience a close-to-real presence of a person in another location; these require high-quality video devices. Also, for efficient communication through telepresence, secure data transmission is required, for which firewalls and security software need to be installed. These add to the cost of the system. These factors increase the total cost of a system and its implementation. Cisco Systems, Inc. (U.S.) is leader in the telepresence market and has played a significant role in the development and promotion of this technology. The company provides communication and collaboration services to its customers. The company offers a wide range of innovative telepresence products that integrate voice, video, data, and software apps. Cisco’s telepresence systems support the H.265 standard for communication that helps users attain high-speed networking; this strengthens the company’s position in the networking market. The company’s innovative technologies enhance its productivity and brand image worldwide. Cisco Systems focuses on strategic acquisitions to expand its business. For instance, in November 2015, the company acquired Acano Ltd. (U.K.). This acquisition would help the company grow dynamically in the telepresence market. 12.4 Huawei Technologies Co., Ltd.